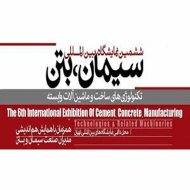 The International Exhibition of Cement, Concrete, Manufacturing technologies and Associated Machineries is held with more than 80 domestic and foreign companies from Islamic Republic of Iran, Turkey, India, China, Russia, UAE and Italy in an area of ​​over 4800 square meters. Concurrently with the international exhibition of cement, concrete, construction technology and related machinery; research units, universities and research units and also industrial and economical companies presented the latest technologies in concrete manufacturing, advances in this field and the most modern equipment for the cement industry and related industries. The report includes: in this exhibition various components of asphalt, screening machine, fixed concrete core machine, cone crushers, pipes and fittings for the concrete foundations, shear walls and ceilings, mining machine, jack concrete breaker, concrete saws, core cutting, concrete molds, concrete curing, vibrating table, slump, straight cut saws, soil compaction hammer, asphalt extraction, and ultrasonic vibration of concrete, concrete laboratory equipment, complete testing equipment, cutting equipment, full tests, hydrometer, complete testing equipment density, type of primary minerals production equipment, design and automation, types of equipment and tools, insulation, refractories and associated industries and supply of filtration is displayed for the view of visitors. Four workshops with the themes of optimizing fuel consumption in cement and concrete, concrete technology, mobile crusher, sand mining, aggregate gradation tests, water absorption tests and aggregate attrition tests of stones and finding new ways of concrete mix designs are the other programs for the International Exhibition of Cement, Concrete, Construction technology and Machinery.